On Memorial Day evening I headed up Mt. Olympus with my roommate Jared. Olympus is such a good workout! The light was great at the top. Not exactly a snow day in the valley, but up high it was cold and dumping snow. It’s almost June, stop already! 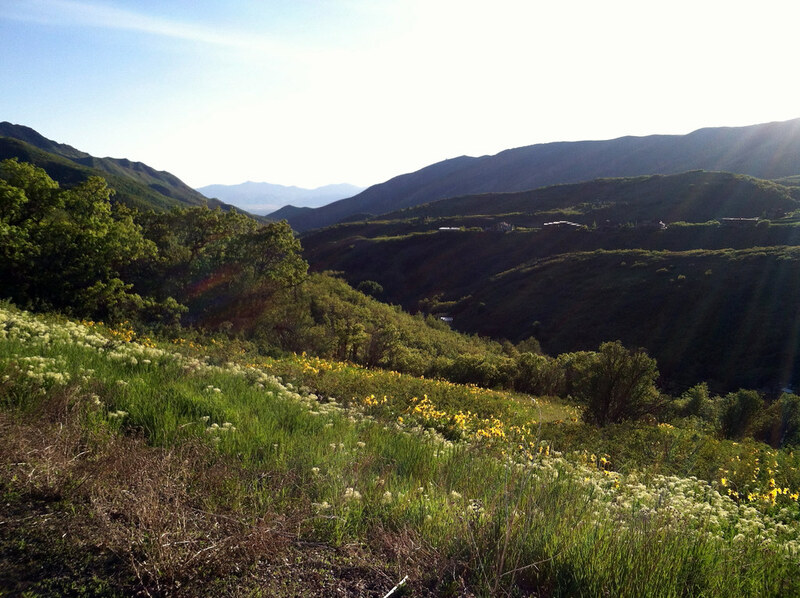 Emigration Canyon is a fantastic bike ride, one of my favorites of all time. 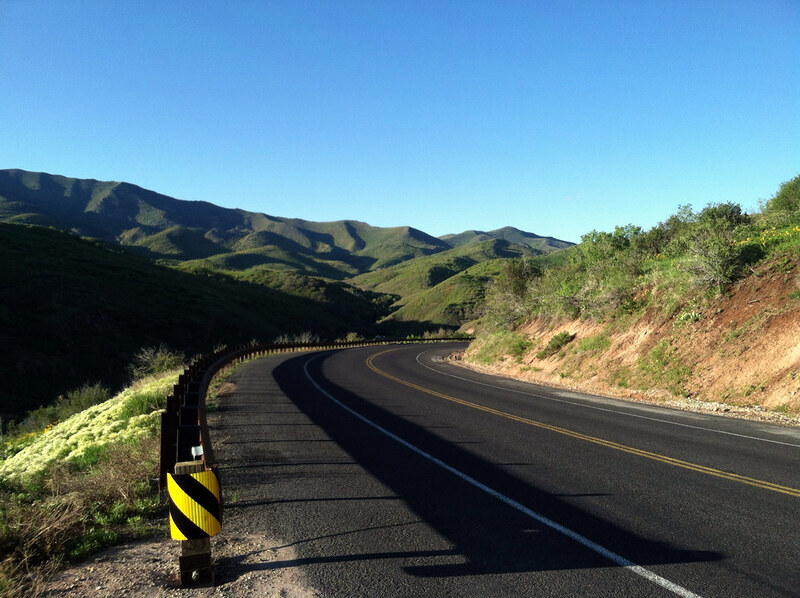 It is a workout but not that painful, the road is good, it’s scenic, and the descent is a blast. No brakes! Just kidding. Dug out the road bike for a great climb and took a quick hike on the side. 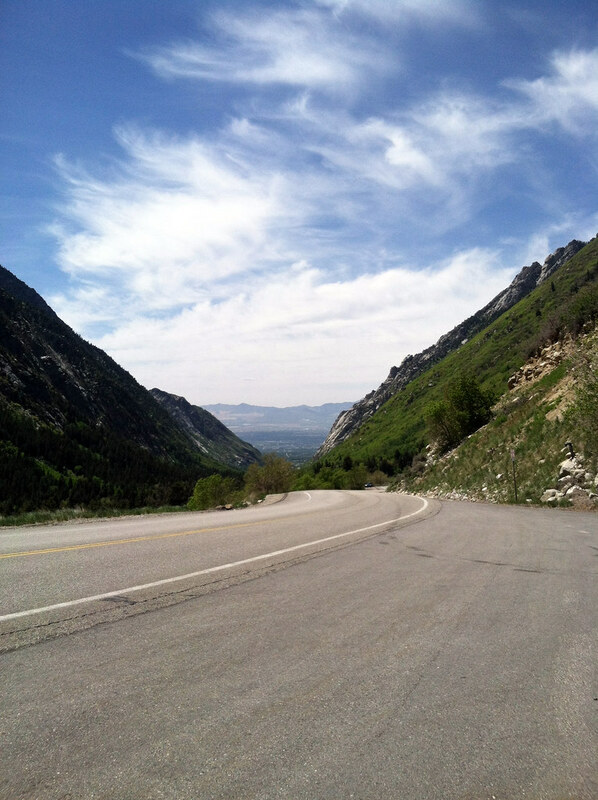 Little Cottonwood Canyon is bounded on both sides by giant granite cliffs and extends East of town. 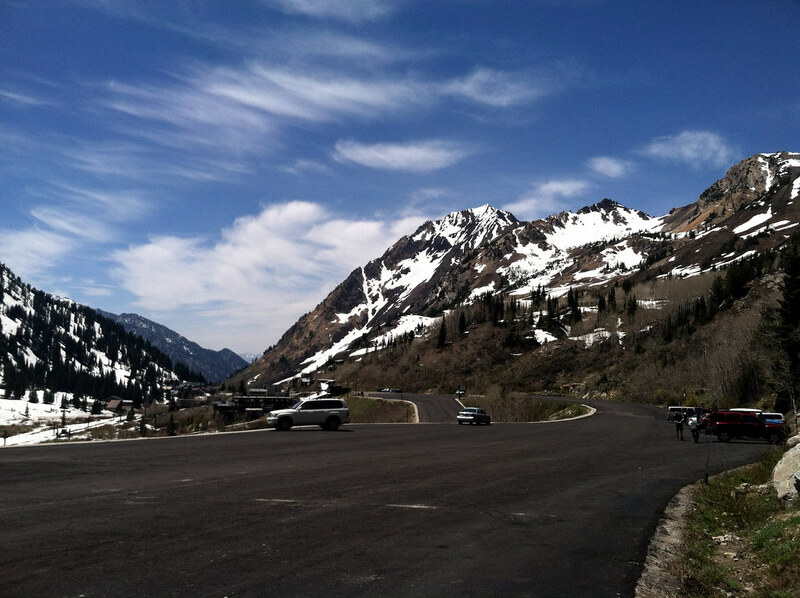 The plan for the day was to ride to Alta ski resort, located near the head of the canyon at the end of the paved road. Coming from the midwest, the largest climb I had ever tried was maybe 400′ of gain, so this was a major attitude adjustment. 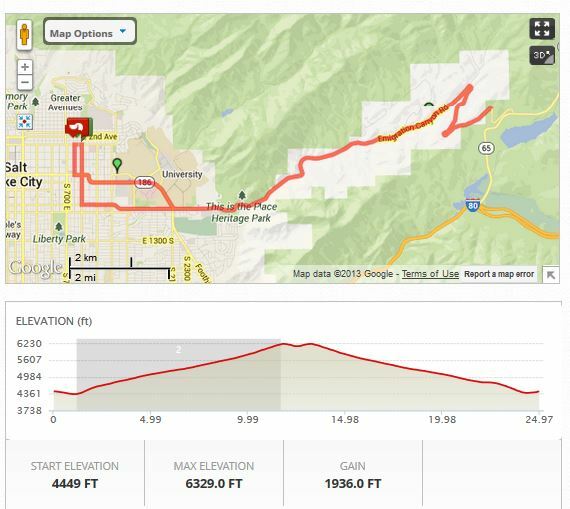 Starting from the LCC park and ride lot, I was surprised at how steep the road was. 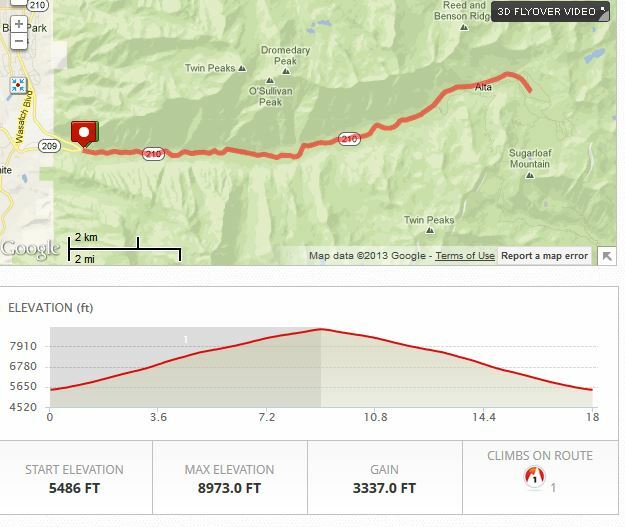 The route is steepest at the beginning and during a couple of hairpin turns in the middle, which is nice since the “easier” part comes when you’re tired. After reaching the top (in about 1:20) I took a breather and enjoyed the sights at Alta. 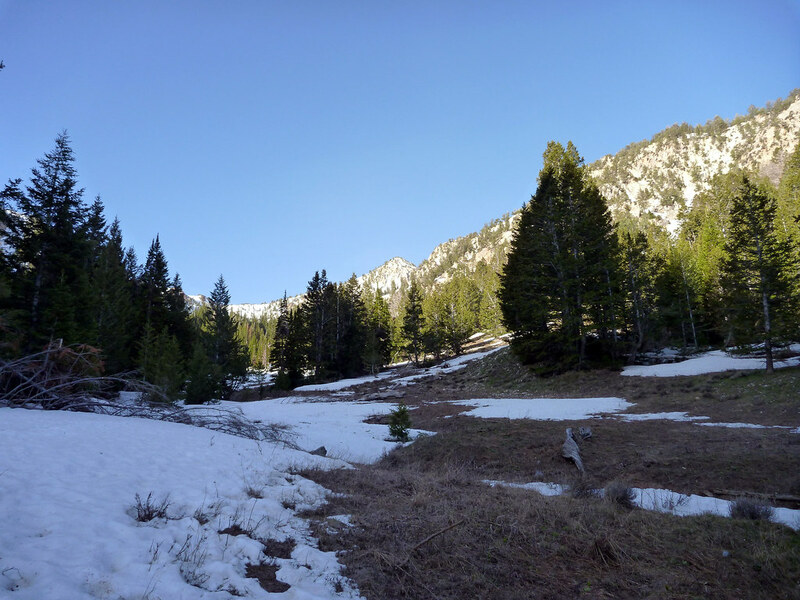 The north side of the canyon is melting out nicely but there is still a lot of snow on the north-facing slopes to the south. The best part was the descent. Just as I had never experienced a 3000′ ascent, this was my first chance to coast at 35 mph for 8 miles. It felt like a roller coaster and made all the pain and suffering of getting to the top absolutely worth it. After flying down the canyon on my bike, I had a few hours to kill. Luckily I brought my hiking gear. 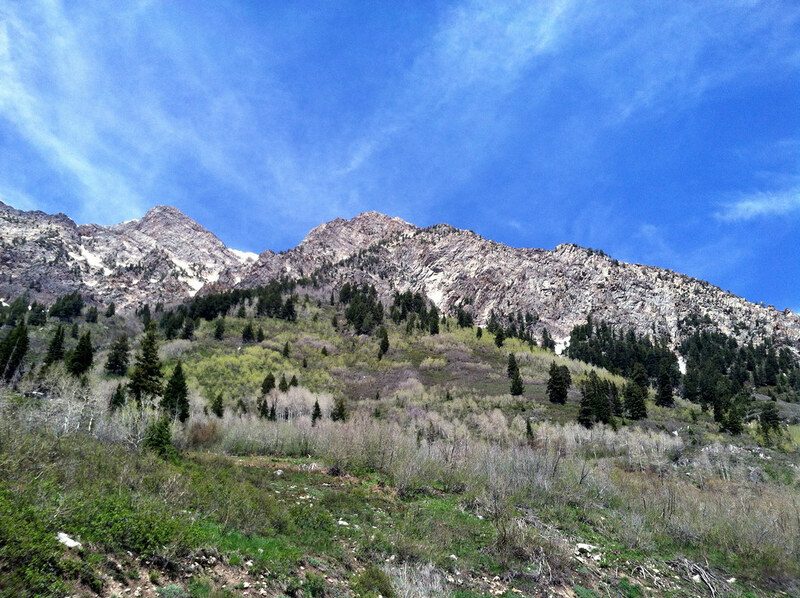 Noting that the north side of the canyon was looking good for melting out early, I decided to hike to Cardiff Pass. 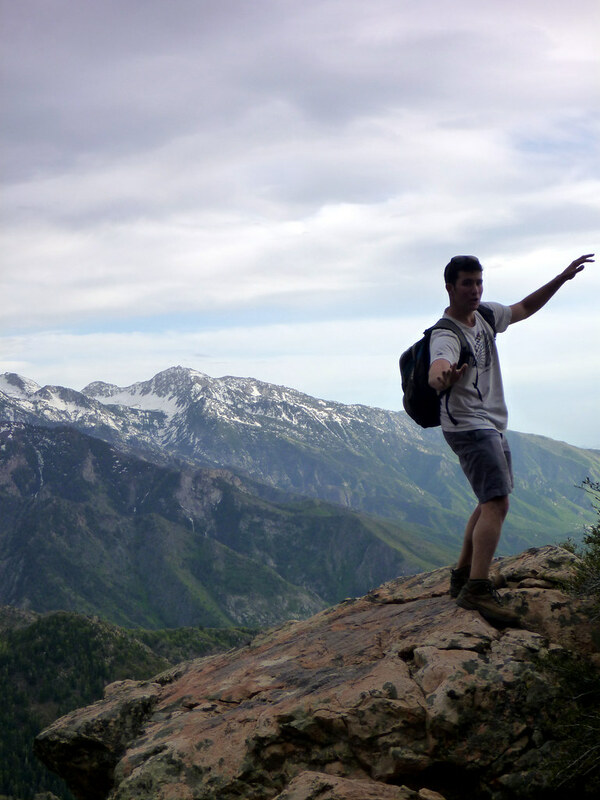 The pass is a jumping-off point for the trails to two of the peaks I want to climb – Monte Cristo and Mount Superior. The hike was unfortunately still snow-covered in the flats, but it was short, and the views were decent. The scrambling routes look interesting enough that I will revisit them in 2-3 weeks once the snow is gone. Is this a trail or a creek? 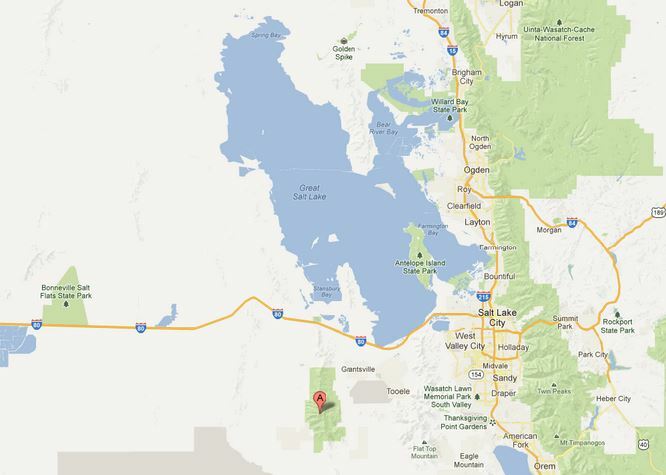 Deseret Peak is a high mountain located on the border of the Great Salt Lake desert, the highest point in Tooele County. 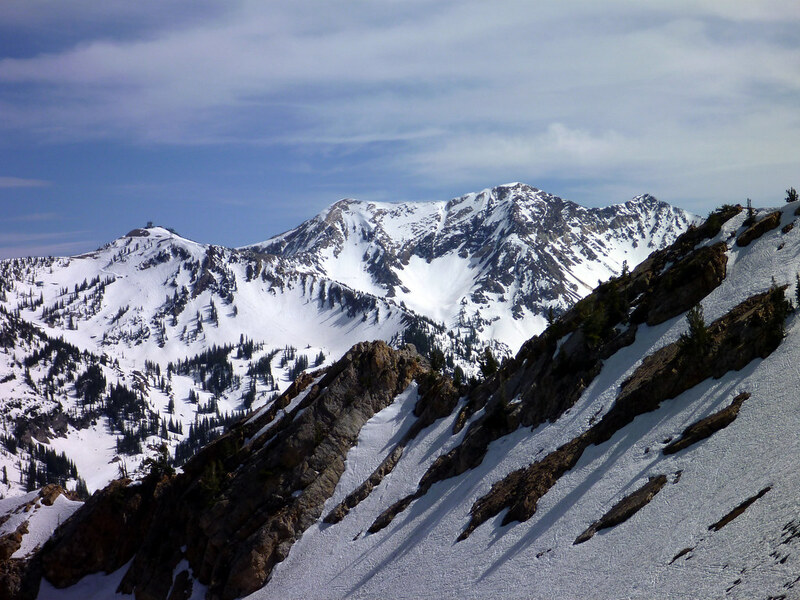 A fun fact about Deseret Peak is that it is the 31st most prominent mountain in the lower 48, with over 5,800′ of prominence. 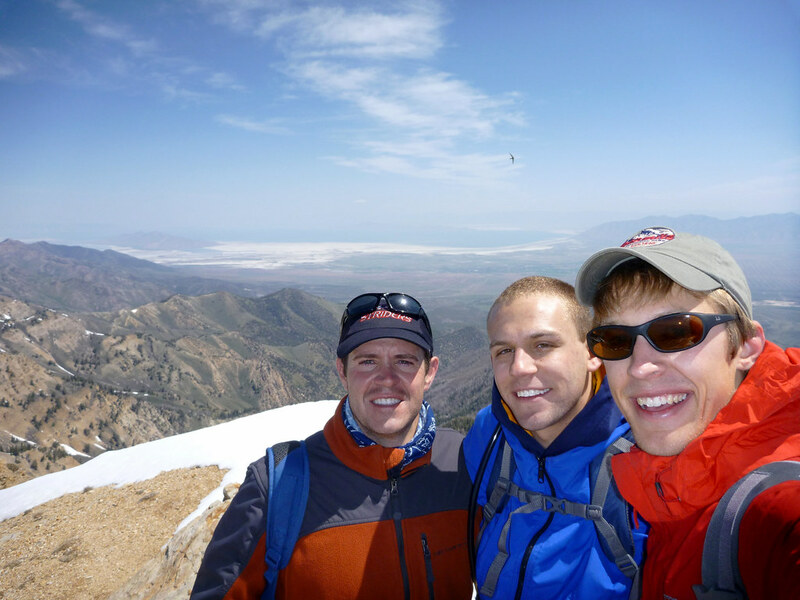 The coolest thing about Deseret Peak is that few people from the Salt Lake area even know that it exists, let alone go climb it. Two coworkers, Simon and Tyler, and I set out to do just that at about 6:00 this morning. 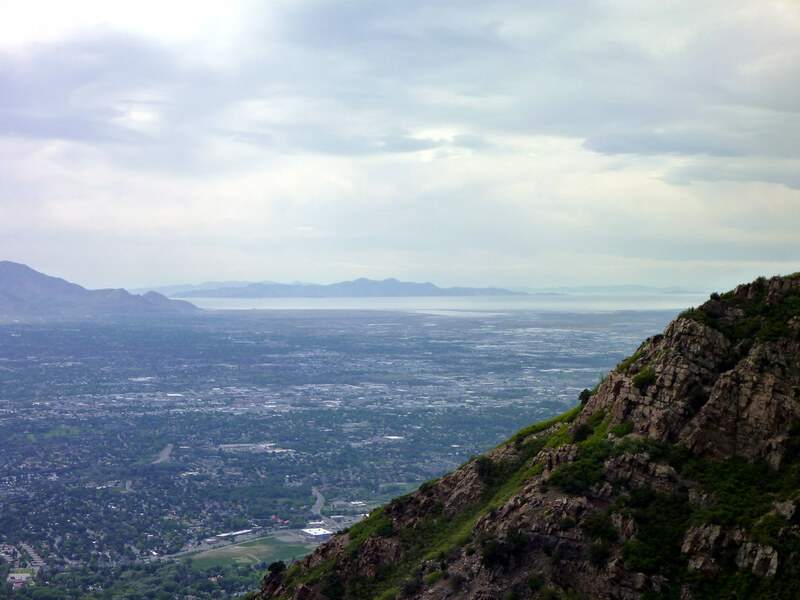 Deseret Peak is located only about an hour west of Salt Lake City, making it reasonably accessible for day trips. 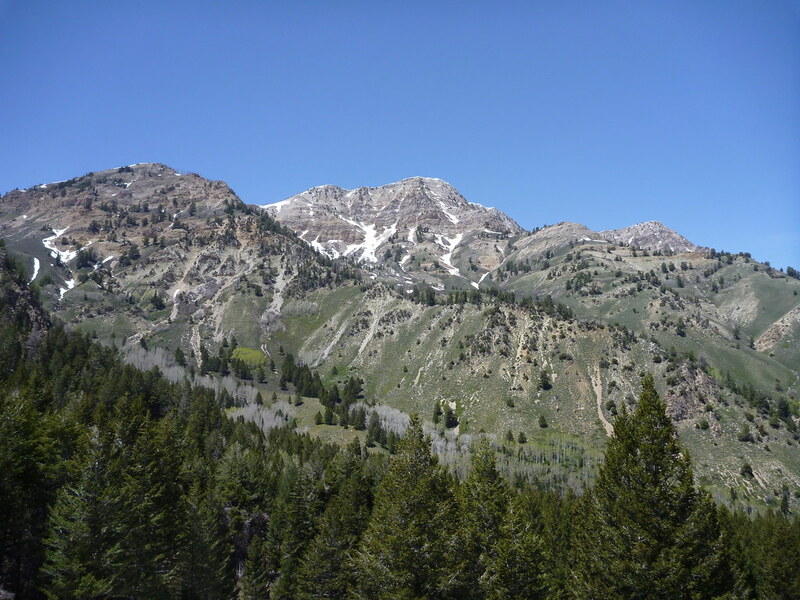 The mountain is located in the Wasatch NF, and is accessed through Tooele and Grantsville by the South Willow Canyon road. The last 8 miles of the road are rough and narrow gravel. 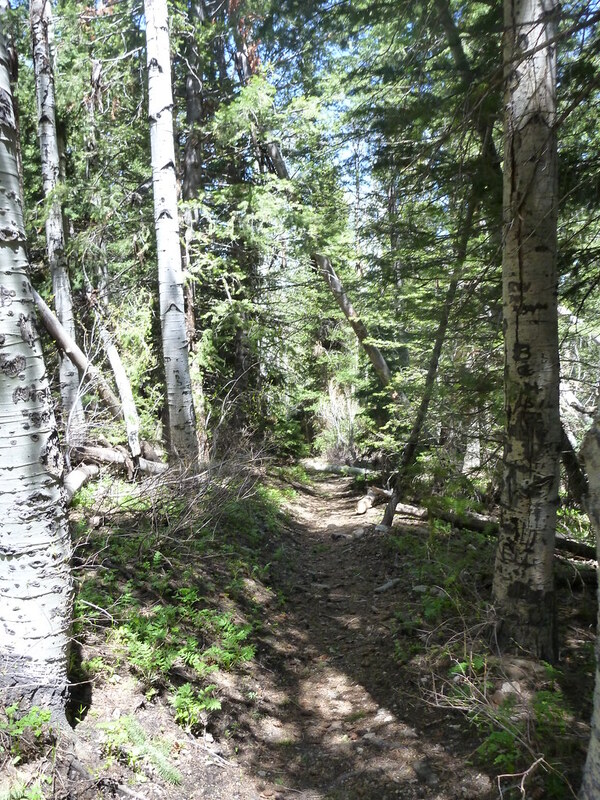 The hike starts out through a forest that seems much lusher than any Utah forest should be. It reminded me of home. 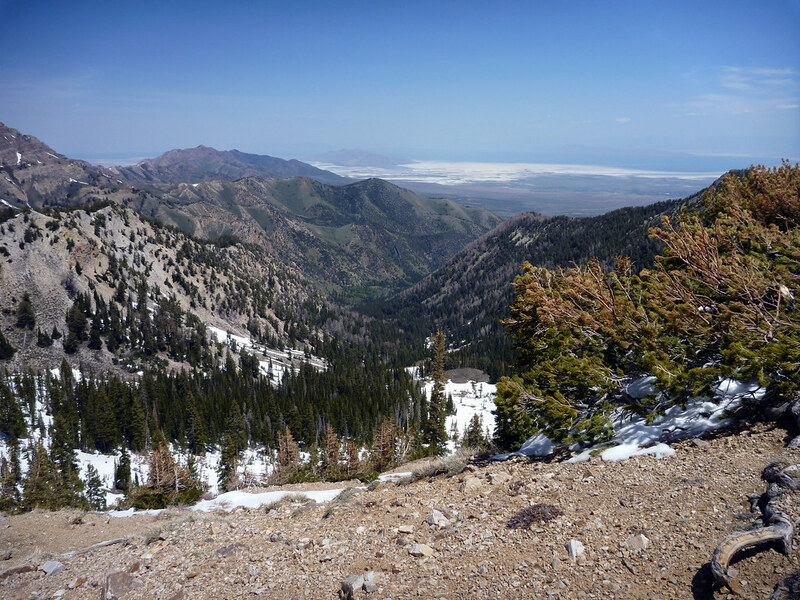 This seems to be an effect of the large snowfall experienced by Deseret Peak and the elevation – much like a “sky island”, the Stansbury range is isolated from the desert below by elevation. 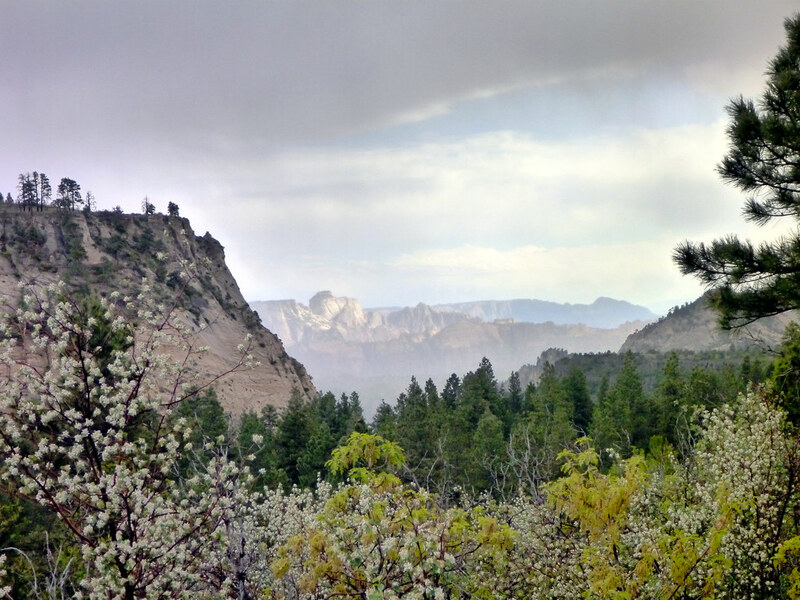 The approach hike quickly took us to the snow line in the canyon (at about 8300′). We lost the trail but headed up to the mouth of the canyon where we knew the route lead. The peak is hidden for most of the approach but an impressive view of the summit is afforded for a few minutes while hiking in the canyon. We didn’t have snowshoes, which would have made the hike so much easier. We managed to find firm snow for most of the ascent but post holed badly a few times. In search of firmer ground, we hugged the west side of the canyon, and almost drifted into the next one over a saddle by the Twin Couloirs (a mistake that would be hard to make if following the trail in the summer). After a typical snow slog straight up the mouth of the canyon we reached the saddle that would take us along a ridge to the summit. 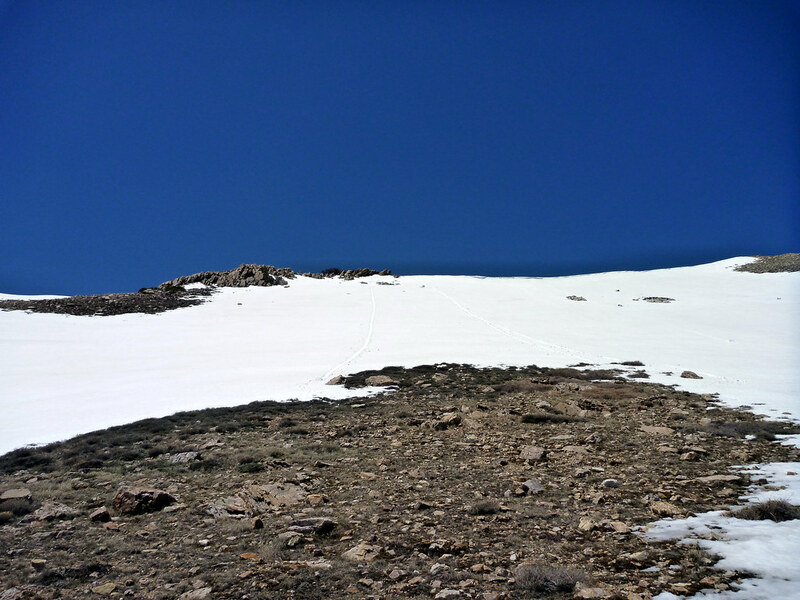 South of the saddle, the snow was shallower due to the greater sun exposure, but there were still patches of soft snow to avoid. We elected to scramble on loose rock instead to avoid extending the slog. Soon the wind really started to pick up. 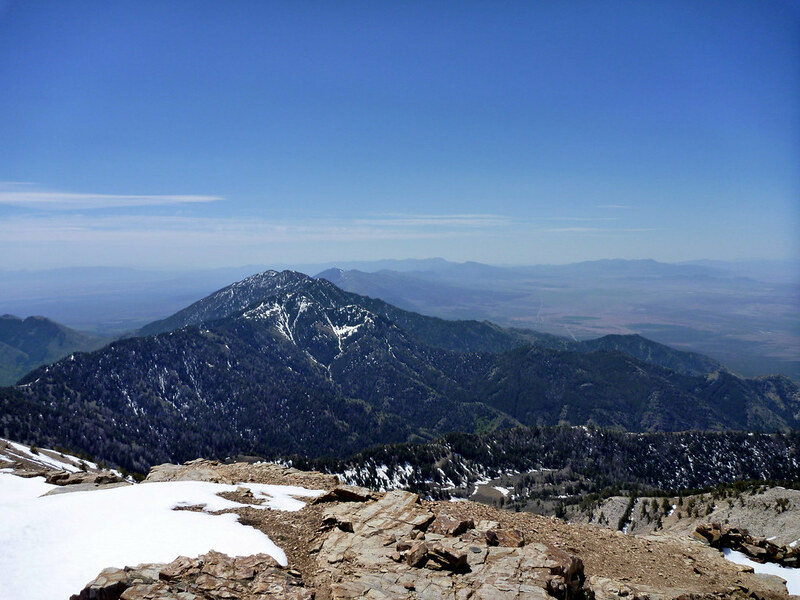 As we reached a false summit, the winds reached 20 or 30 mph in gusts, which made the 57 degree day feel a lot colder. After taking in some views, we continued down the summit ridge, now with a clear view of our objective (past some lingering cornices). We stayed to the south (left) to avoid the cornices and stay on more rock. 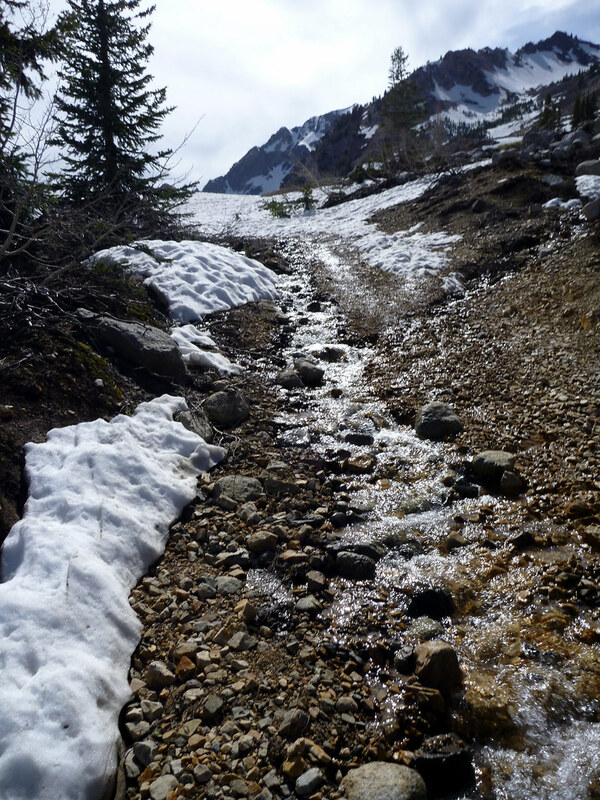 The trail was sometimes melted out, sometimes not. We basically ignored it and pressed on along the ridge. 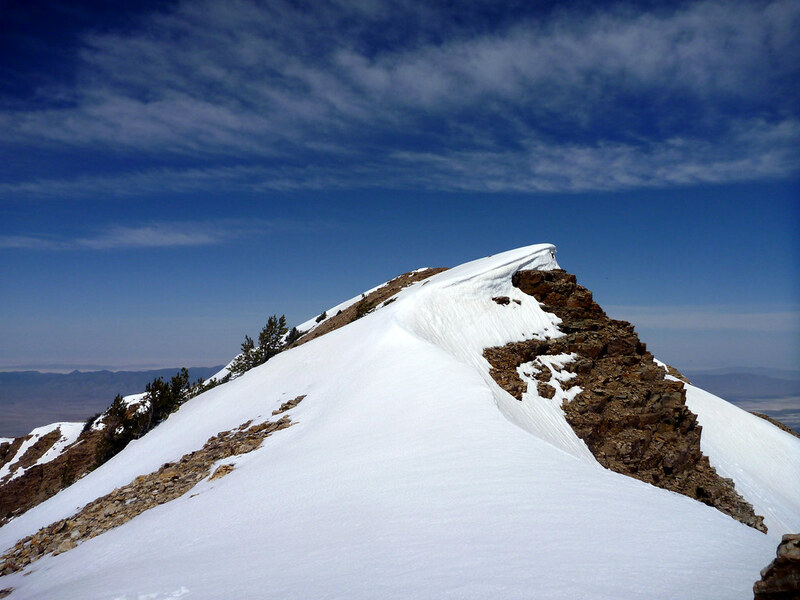 Within a few hundred feet of the true summit, we reached a high point with a steep snow slope between us and the goal. We were ready to turn around when I spotted a thin strip of exposed rock leading to the summit. We were able to reach it, and used it to avoid putting ourselves in a potentially dangerous slide with no ice axes to arrest. Finally, we were on the summit (at about 12:15). It was cold and very windy but we stayed around for maybe 20 minutes enjoying the sights. 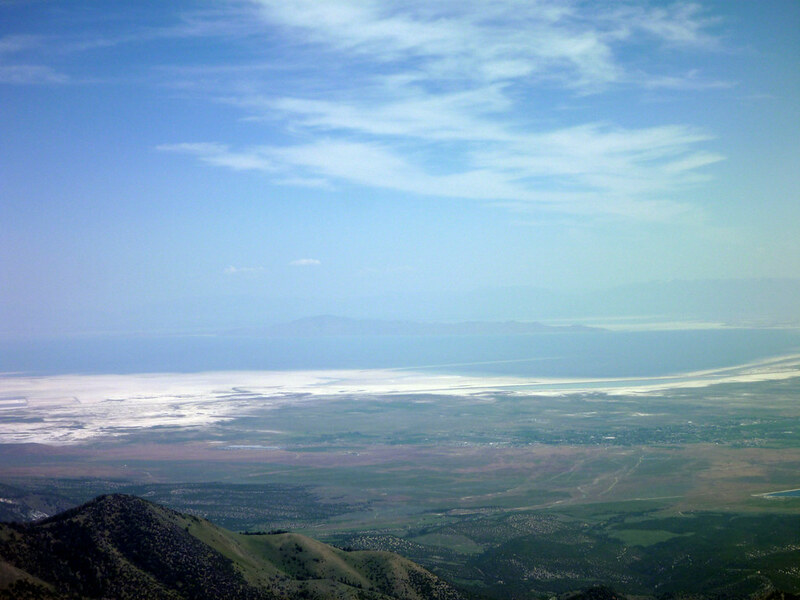 To the West, we could see the great expanse of the Salt Lake Desert. Beyond, we could barely make out Ibapah Peak, another county high point, 80 miles away. 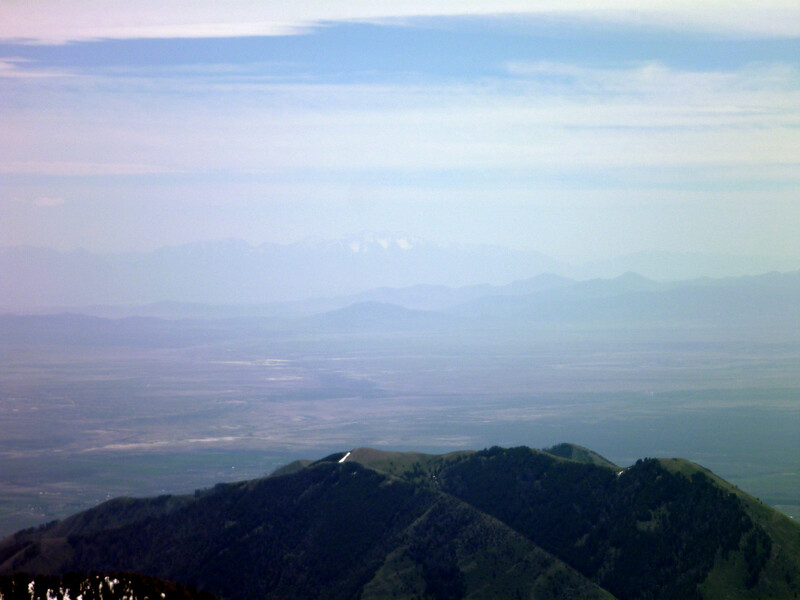 To the north and east, across the Tooele Valley, was a great view of the Great Salt Lake, and the two mountain ranges which bound Salt Lake City – the Oquirrhs and the Wasatch. and glissading down some perfect snow slopes to reach the saddle. The descent to the trail was a pain because of the even softer snow. We were dropping to our hips in snow before just deciding to boot-ski and slide down the rest of the way (where we could) and generally slog it out. We learned that this peak needs another month to melt out for it to really be in prime shape. 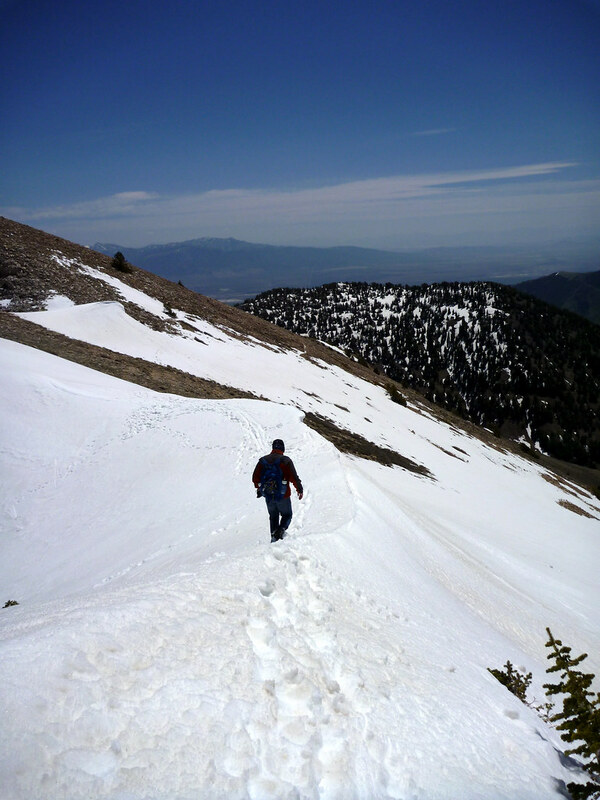 Deseret Peak would be a straightforward hike when dry, but it turns into more of a mountaineering trip when snowy. 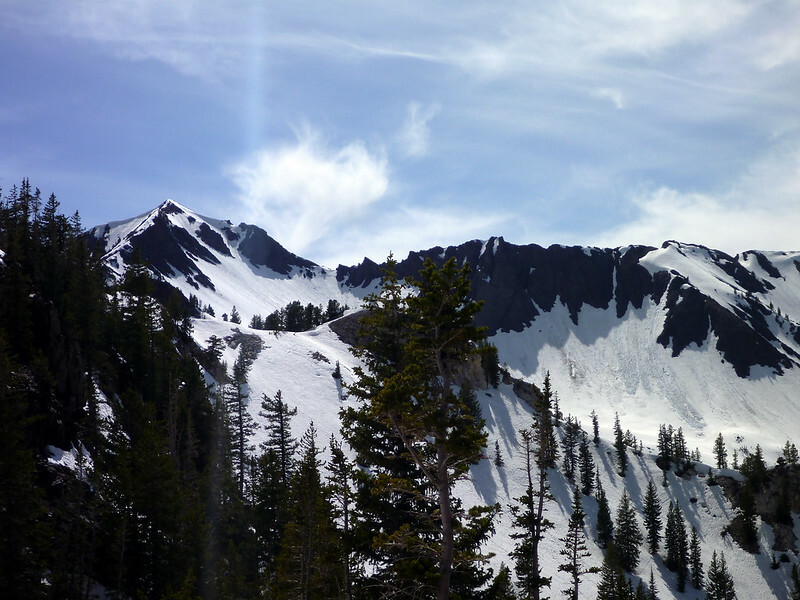 Use caution and wait until later in June and this peak would be a great day hike. Our trip was still a great trip, but we would have preferred not to waddle around in the soft snow when there’s a nice trail right underneath. We made it back to SLC with soggy boots by 3:30 or so. 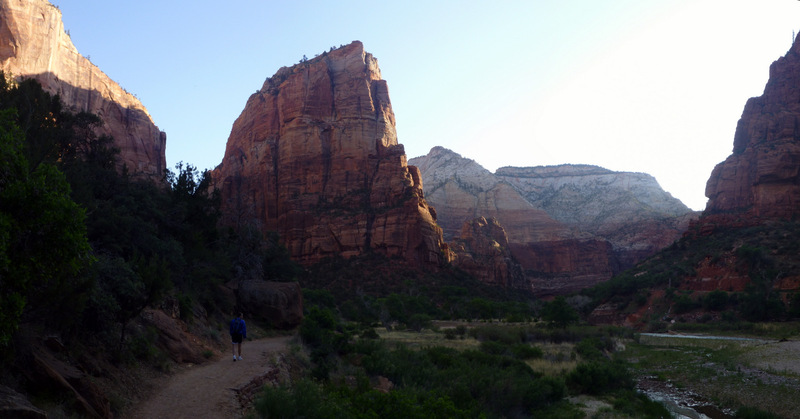 Day 2 in Zion began with the sunrise at Lava Point campground. 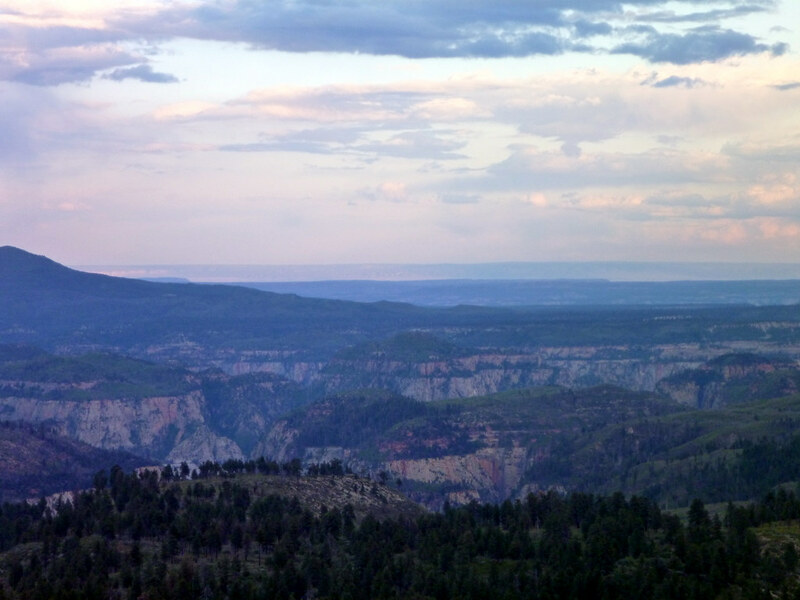 We walked to the overlook to see what the high country looked like in different light – it was a great view. We then caught a ride back to the Wildcat Canyon trailhead for a couple of quick mountain climbs – East and West Northgate Peaks. It looked to be a perfect weather day – barely any clouds in the sky and no chance of rain in the forecast. We left the rain jackets in the car and packed light. To access the Northgate peaks, we hiked about a mile along the Wildcat Canyon trail and then took a spur for about another mile. This led to an overlook between the twin slickrock domes. 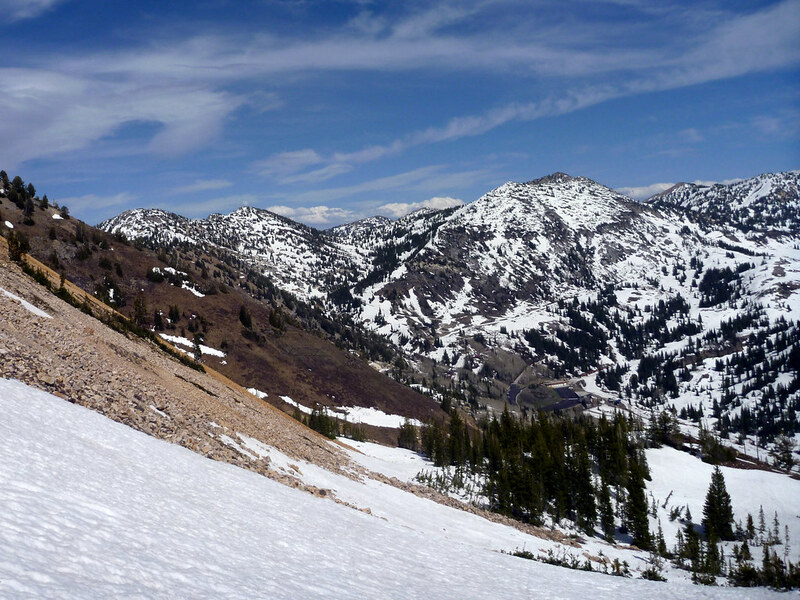 An easy bushwhack to the east takes you to the base of a beaten trail up East peak. We elected to pick a bit more interesting route left of center which stuck more to the rock than to the dirt and trees. 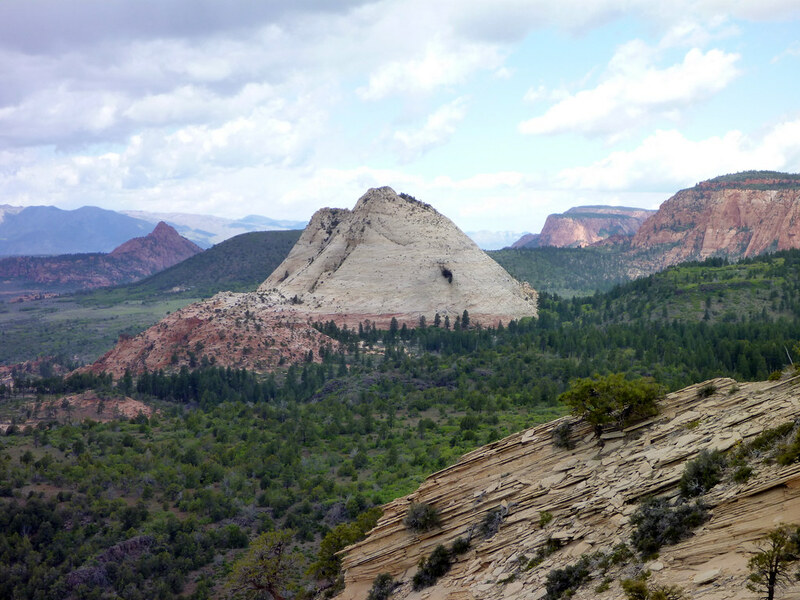 While most of the East peak is covered with trees and brush, the summit affords a 360 view of the Kolob Terrace. It is so accessible that I would recommend that anyone traveling through the area consider hiking to the top for a unique view. We were alone on the summit and it did not look like many visitors spend time up there. We cooked an oatmeal breakfast on the summit, sat for a while, then headed down to tackle the West Peak. We followed the beaten trail down the center of the north slope, traversed below the lookout to avoid unnecessary elevation gain, then linked up with the base of the West Peak. 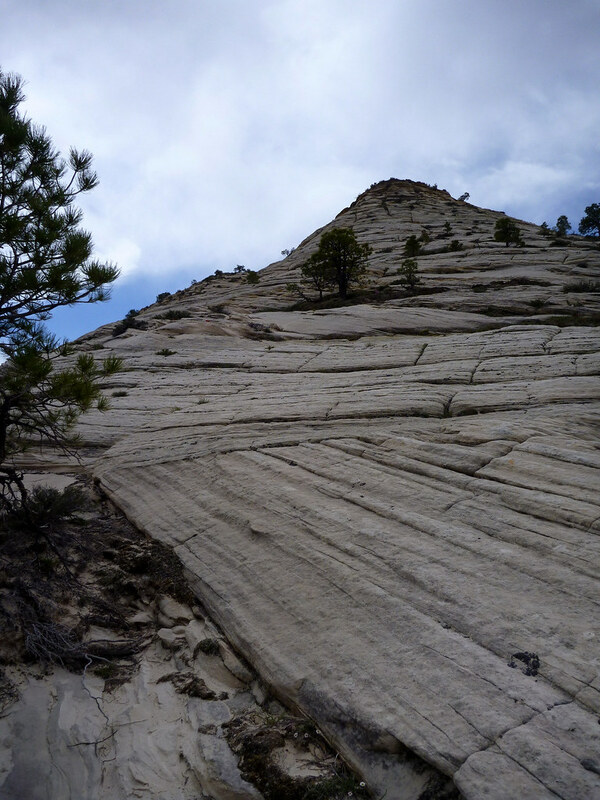 West Peak is a massive slickrock dome with steeper dropoffs than its twin to the East. Apparently there is a scramble route on the steep east face – we chose the more moderate north slope. From the base of East Peak, we traversed around the base of the West Peak dome along slickrock. It was cool to see how the rock interacts with the forest – a very stark contrast exists between the life of the forest and the dead zone of the mountain. The climb was straightforward. We found a system of ledges to take us to the false summit where the climb steepened a bit, but nothing more than Class 3. The consequences of a fall wouldn’t be too terrible unless the slickrock were wet. What made things interesting is that clouds started to roll in from the northwest. The clouds looked like they would avoid us, but Simon and I rushed to the top just to be safe. Right as we summited, I started to feel rain drops. Normally I wouldn’t have been too concerned (no lightning) but with the nature of slickrock, water can make the down climb super treacherous. We took a couple of photos and dashed down as quickly as safety would allow. 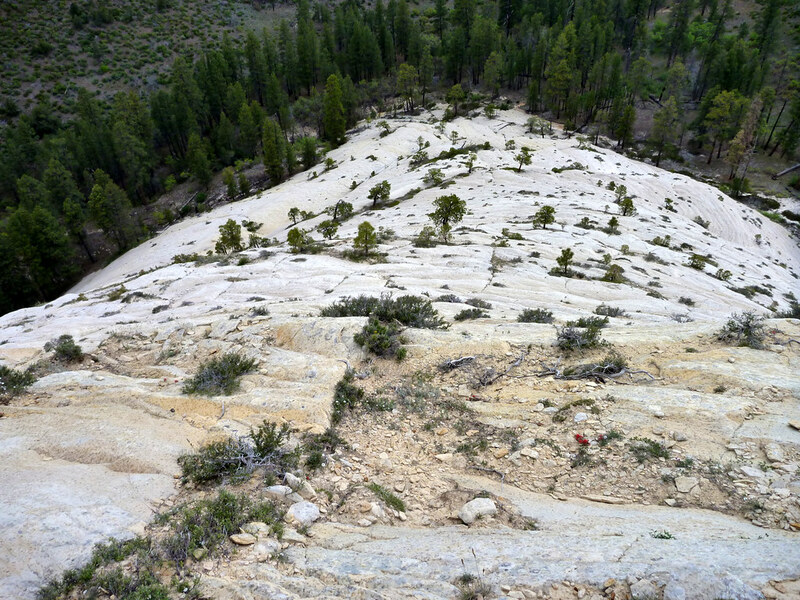 We avoided descending while the rock was too wet – it was still quite steep. I found the view down the route pretty exciting and vertigo-inducing. Needless to say, we made it down in one piece, with three new summits in hand for the weekend. As we bushwhacked up the hill back to the overlook trail, we met up with a group of lovely ladies from Las Vegas who were similarly unprepared for the rain, so we all chatted as we dashed back to the trailhead to get warm. 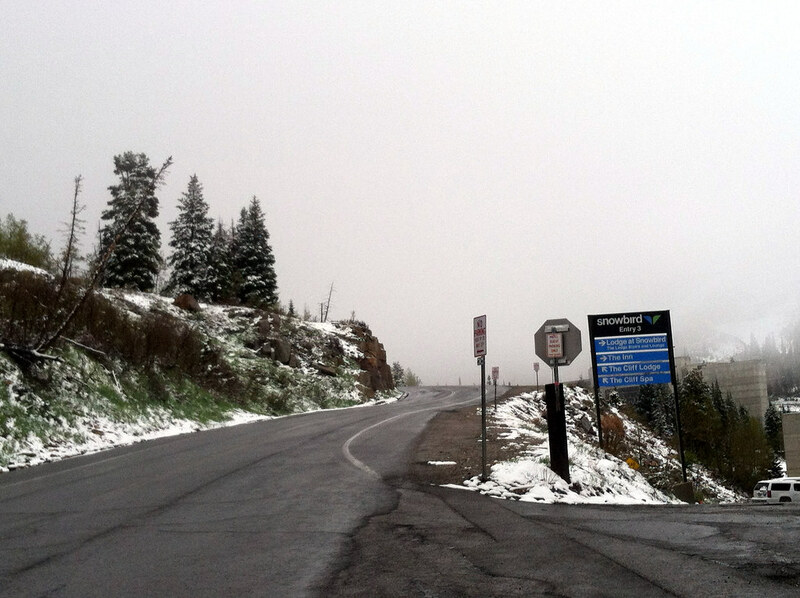 As we traversed the Ponderosa forest, graupel started to fall. I was not amused. We left the park by about 1pm and were back in SLC by 5:30. It was one of the best weekend trips I can remember, and I hope that I get a chance to return to the area one day, maybe in the fall when conditions make the park look completely different. 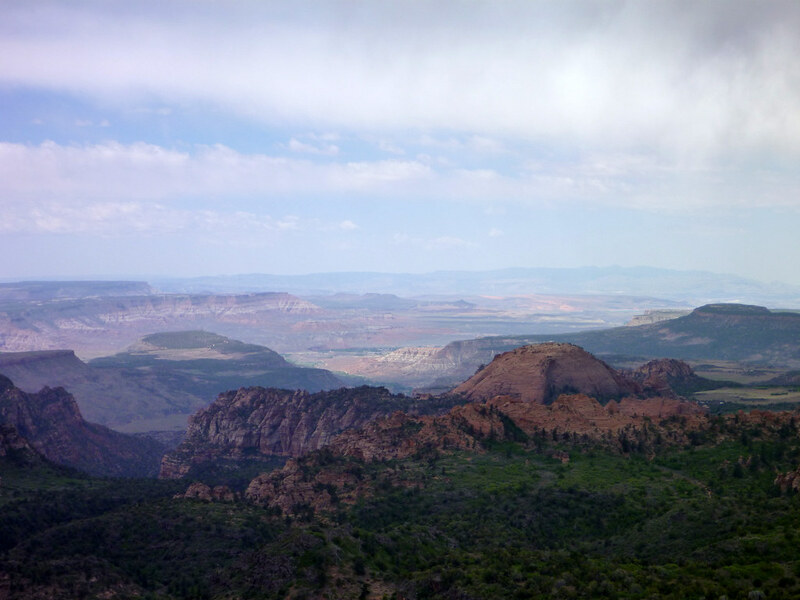 On Friday night, my internship project partner Simon and I headed down to St. George, UT in preparation for a weekend at Zion National Park. We woke up early in the morning to avoid the rush and catch the first shuttle into the park, which ended up being a good move. There was plenty of parking, and the gates hadn’t started collecting fees yet, so we got in for free! 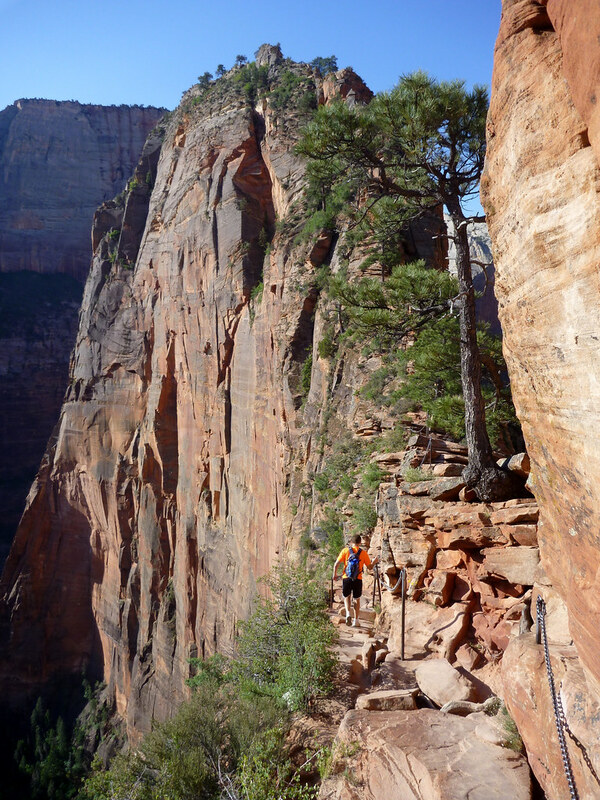 Angel’s Landing is a well-traveled hike to a sandstone peak right in Zion Canyon. The approach starts from the Grotto shuttle stop and takes the West Rim trail. 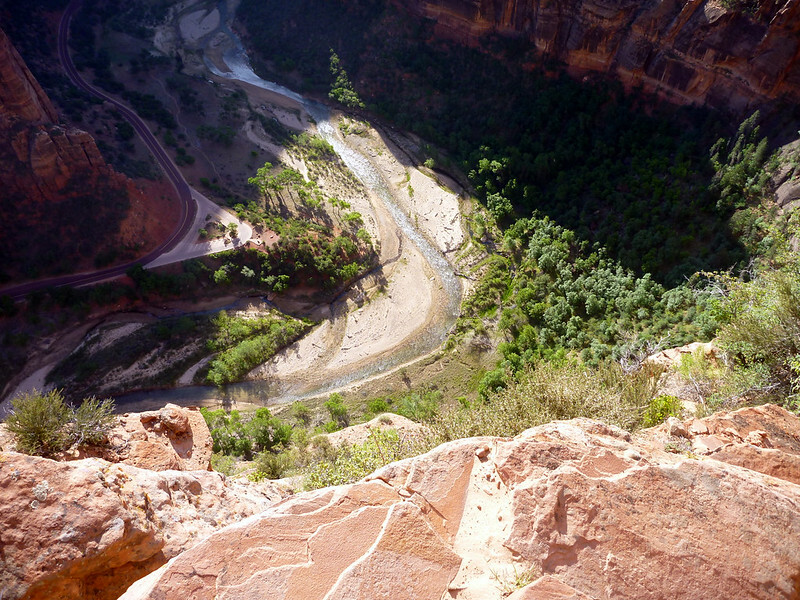 The initial part of the trail follows the river, then begins to climb into a narrow canyon. The canyon was very quiet and distinct echoes could be heard. In the summer it would be very refreshing to walk through here since it is shaded and a bit damp. 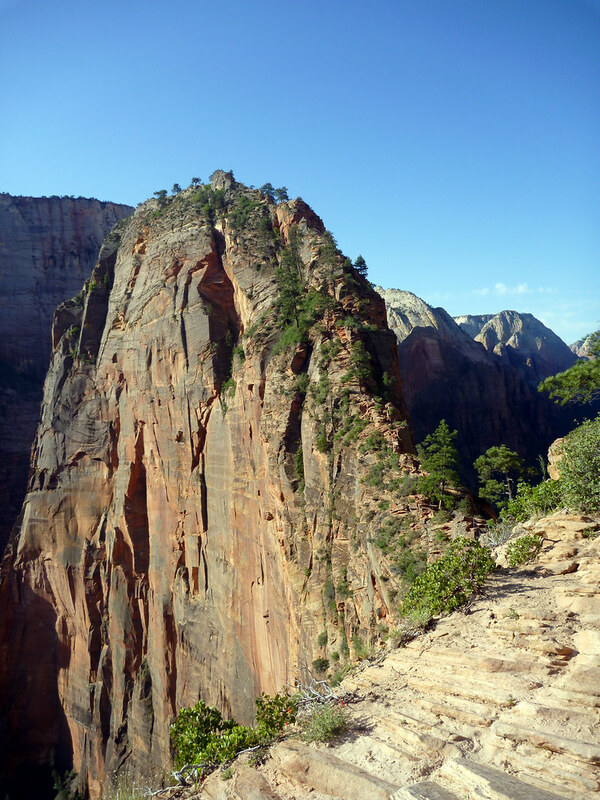 The trail then turns up the hill and follows about 10 switchbacks until the saddle of the Angel’s Landing trail. From here, the trail gets more rugged and quite exposed. 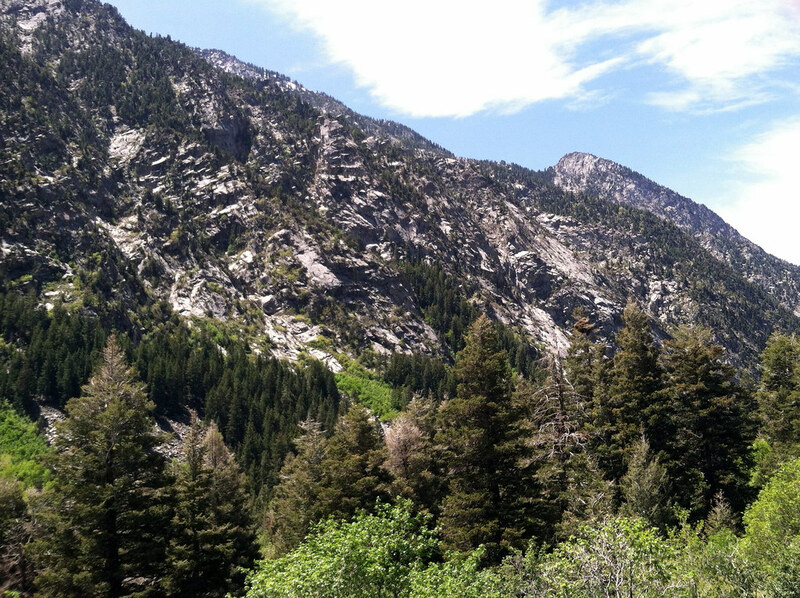 At places along the hike, the drop off is almost 1500 vertical feet, but the trail is only a few feet wide. I didn’t find it too scary but some people definitely would. 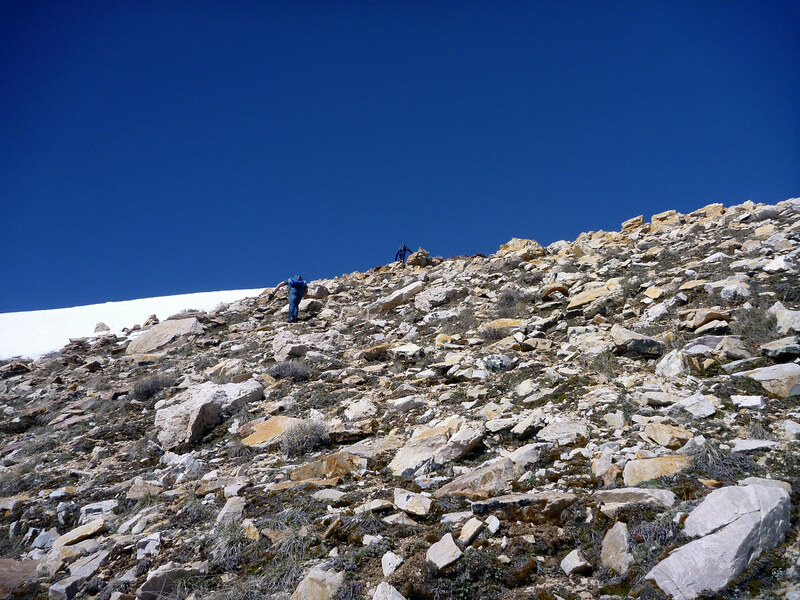 The hike past the saddle and along the knife-edge ridge was pretty exciting. There are chains to hold on to for nervous hikers but I actually found it easier not to use them. We appreciated getting an early start, as no one else had reached this part of the trail on this particular day. A few people arrived after about 20 minutes, but we had a chance to eat breakfast and enjoy the solitude on our own. There were a couple of pesky chipmunks which wouldn’t go away – they wanted to eat our crumbs. Don’t feed the wildlife! Soon more people started to arrive, so after close to an hour on the summit we descended. The route was pretty quickly turning into a zoo, and we spent more time coming down due to people passing along the narrow sections of the trail. Nevertheless, we found ourselves on the canyon floor with the entire afternoon to kill, so we decided to do some side hikes before lunch. 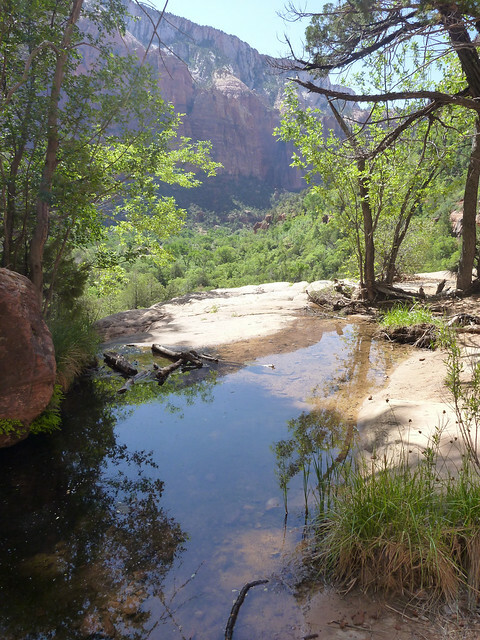 We picked out a couple of additional sights to see before leaving the canyon – the Emerald Pools and Weeping Rock. 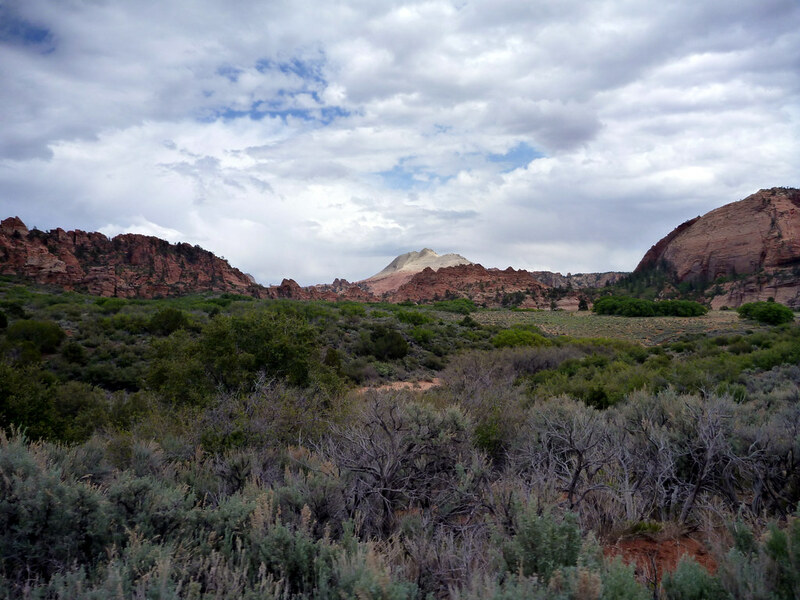 The Kayenta Trail took us from the Grotto over to the pools. The trail to the pools was crowded and flat, with not a lot of shade. 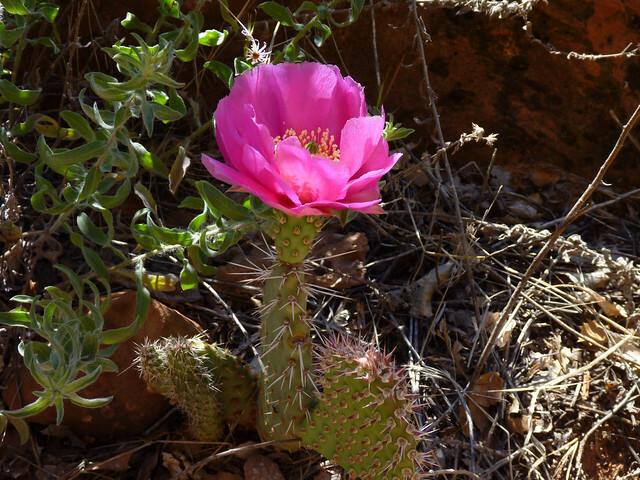 We did see a cool cactus flower though – what a great time to see the canyon! 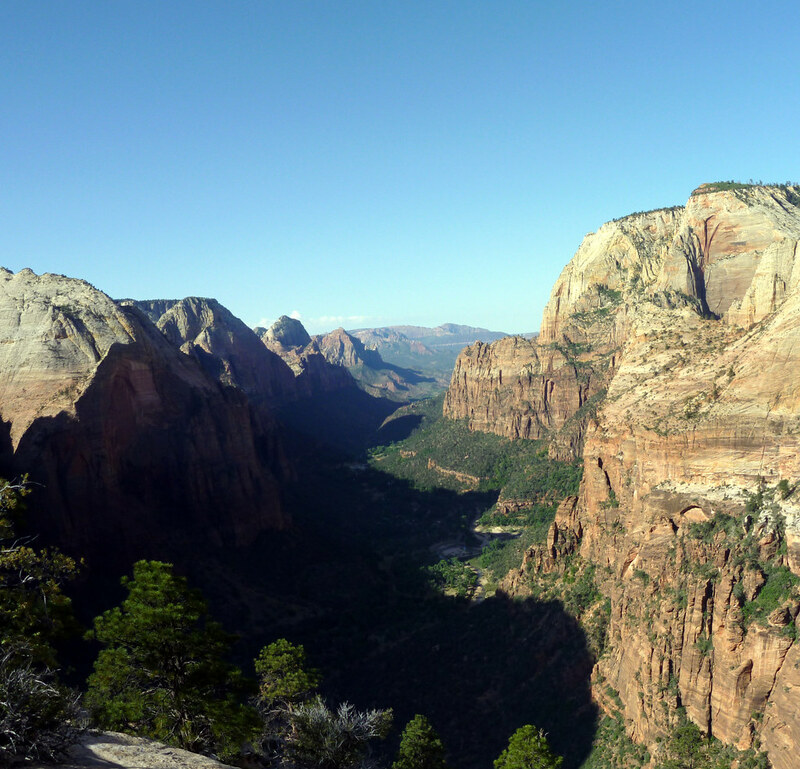 The Emerald Pools were sort of cool but a little underwhelming after the views on top of Angel’s Landing. In the summer the cooler temperatures by the pool would be a treat though. Next we hiked back to the shuttle and went to the next stop in order to see the Weeping Rock. 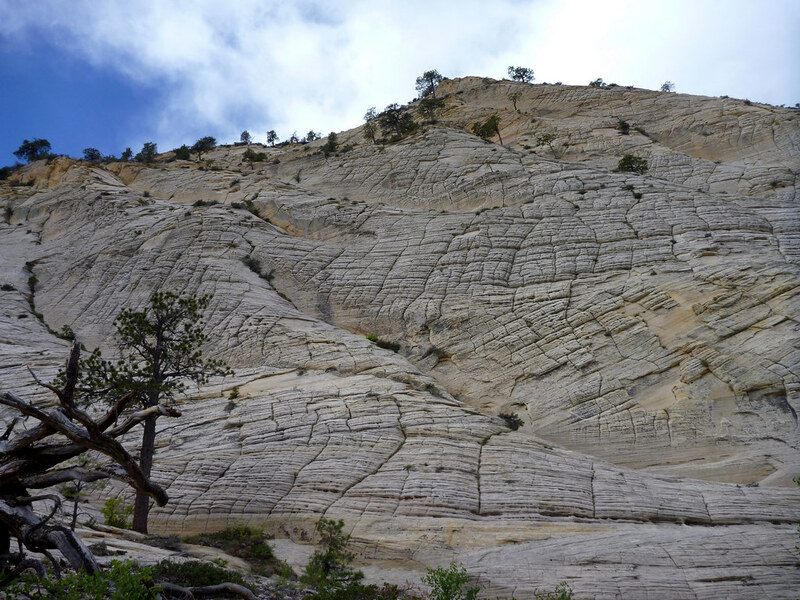 The rock is formed by a layer of porous rock in the midst of the sandstone which allows the aquifer to leak out all year long, creating a sort of hanging garden. 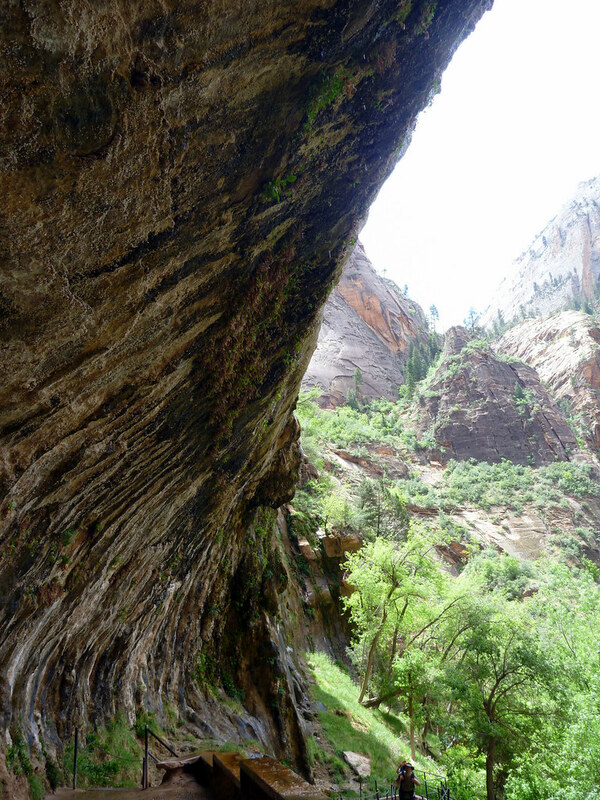 The best place to see the rock is in the overhanging “cave” accessed by the main foot trail. There were many people around but the cave was still worth seeing. After seeing the highlights of the canyon, we were tired of tour guides with microphones, screaming kids, and cranky people, so we headed into Springdale for burgers at Oscar’s (highly recommended). After lunch, we hydrated and headed for the high country for some solitude. 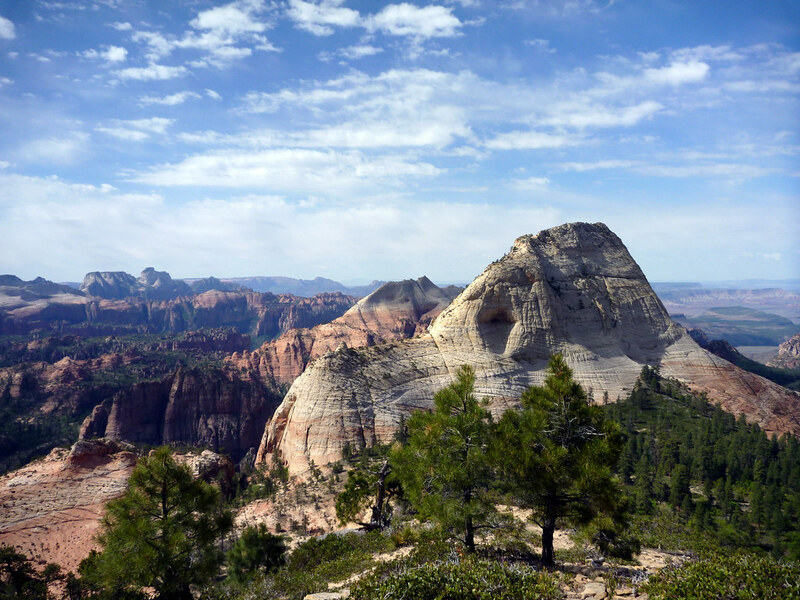 The Kolob Terrace is located in the northwest section of the park, and is accessed by a road out of Virgin, UT. 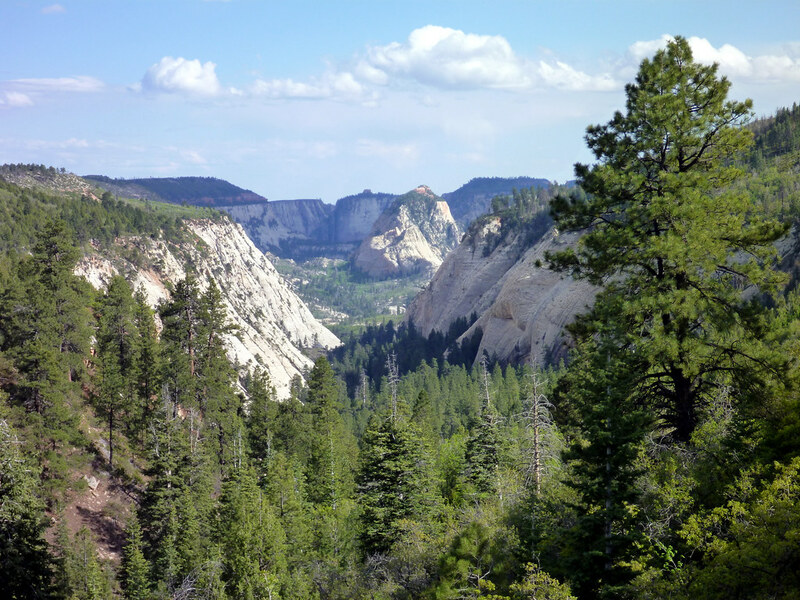 Zion is known for hosting several microclimates. 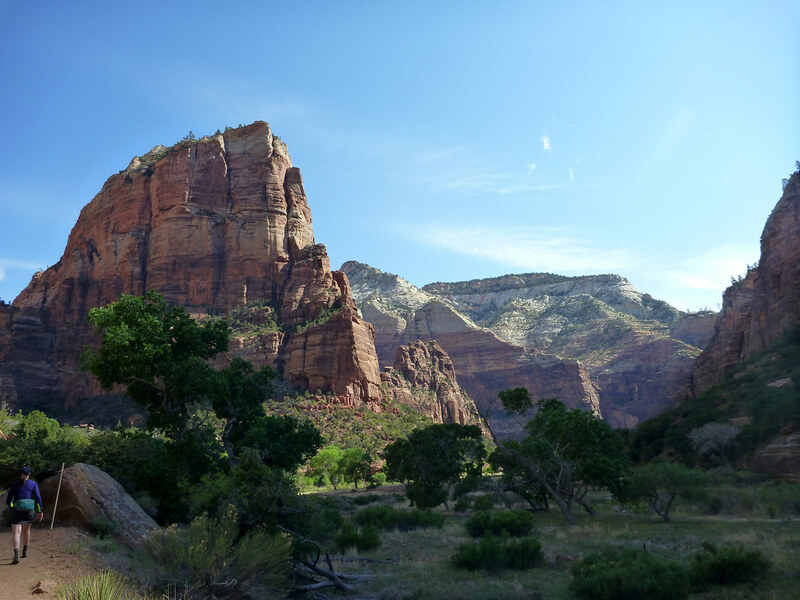 The Kolob is higher and wetter than other areas of the park and makes an interesting change of scenery. The drive out to the Kolob took us through arid desert, badlands, cattle pasture, and even a weird family compound. We arrived at the trailhead for Wildcat Canyon about an hour after leaving Springdale, and hit the trail at around 4 pm. We made good time across the mostly flat ground along a wide pack trail. 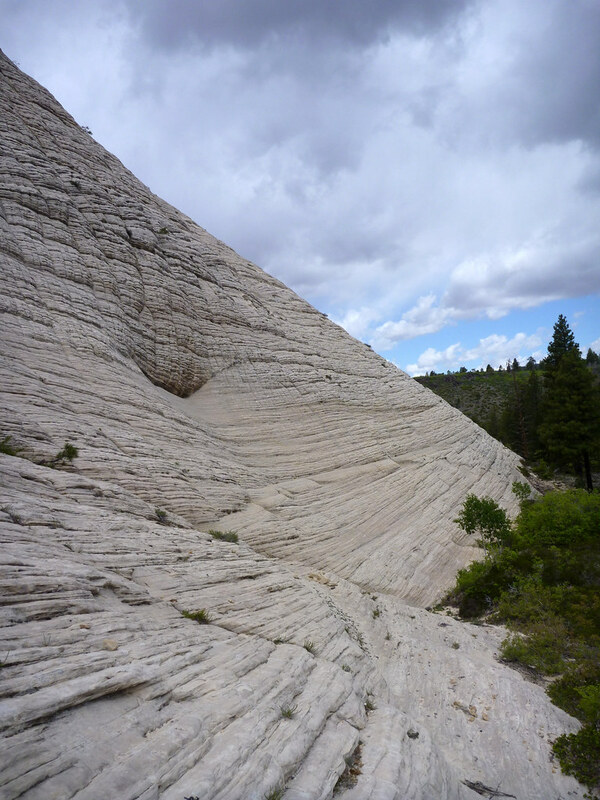 Highlights of this part of the Wildcat Canyon trail included the Ponderosa pine forest and views along Russell Gulch, a vast slickrock canyon. 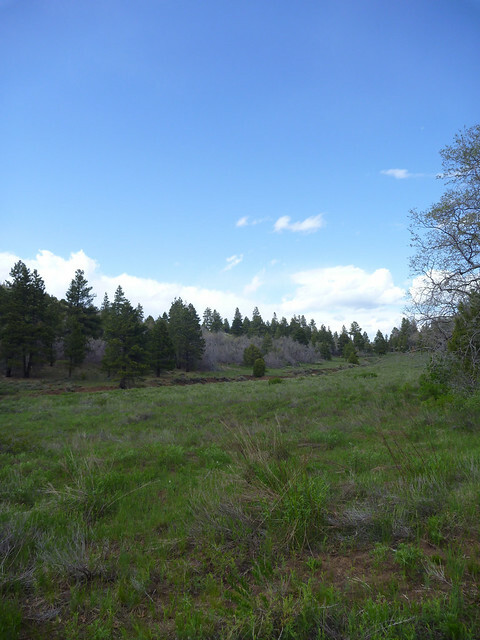 After passing Russell Gulch, the trail descended across a recently burned meadow. Man did I miss the beautiful big Western sky living back east for the gloomy months. Originally we planned to camp in the meadow but we still had a lot of energy so we decided to press on. Wildcat Canyon had great views of the rock features to the south. There was a well-marked, flowing spring just before the mouth of the canyon but we didn’t elect to fill up water since we already had plenty with us. Above us, we saw a large plateau with imposing drop offs and what looked like a great view of the park. We got out the map and picked out Lava Point as our final destination for the night. The trail to Lava Point was a bit longer than anticipated, and after almost 15 miles of hiking for the day and 2000 ft of elevation we were a bit worn out. We were happy to find a camping space at the Lava Point campground, cooked dinner, then walked over to the overlook to watch the sun set over the park. 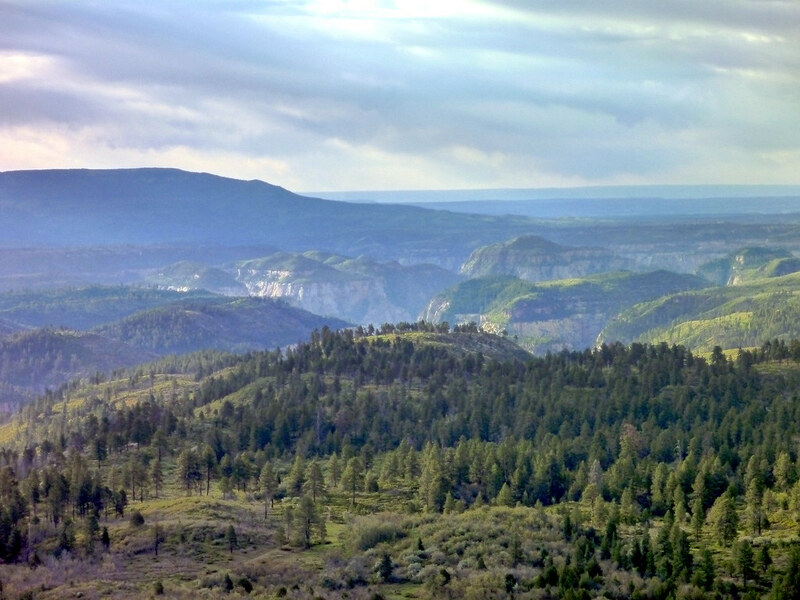 Here at the edge of the Colorado Plateau, one can see the erosive forces at play in the park and the massive geological formations which shape this area of the country. We lingered for around an hour, and made conversation with Zeke, a retiree who was traveling the country from park to park in his van. Sounds like a pretty good way to spend the summer. He agreed to drop us off back at the trailhead the next morning which was a great alternative to backtracking six miles. After the sun went down, the clouds cleared up but the moon was too bright for good stargazing. 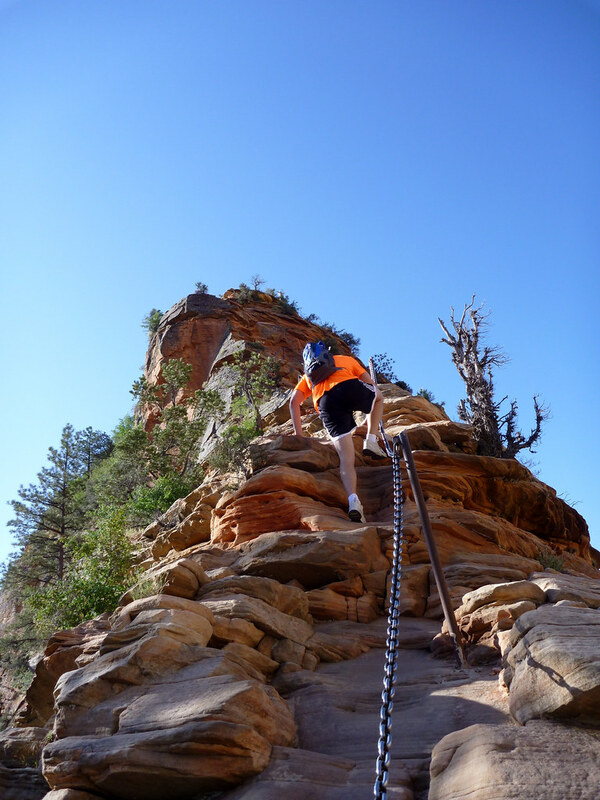 After a chilly night, we woke up ready to finish out the park with a little bit of slickrock scrambling.